You will see royal Himalayan Mountains and landscapes in this ride. Chardham Tourism offer chardham by Helicopter from our base camp Haridwar and Dehradun, you can cover chardham Yatra and you will see royal Himalayan Mountains and landscapes in this ride. Chardham Yatra by helicopter in 4 nights and 5 days propose you an opportunity to pay respect to your lords and get pleasure from some energizing moments; nestle in the circuit of nature. While Yamunotri is the place of river Goddess Yamuna, Gangotri is devoted to Goddess Ganga. Badrinath is identified as the abode of Lord Vishnu and Kedarnath is a shrine devoted to Lord Shiva. Chardham Tourism offers the complete solution for chardham yatra by helicopter with booking services for 2019. We are faithful to offer following facilities throughout Char Dham by Helicopter, but in the Himalaya weather is not good, then flight plan may be changed. Chardham Tourism is the budget tour planner for char dham packages. We have complete char dham Tour Packages for every one as char dham Dham Bus Tour, chardham Dham Yatra package, chardham package, chardham package, chardham yatra packages, char dham yatra package from haridwar, char dham yatra details, char dham yatra package by helicopter, char dham yatra package by car, char dham yatra mapand lots more. 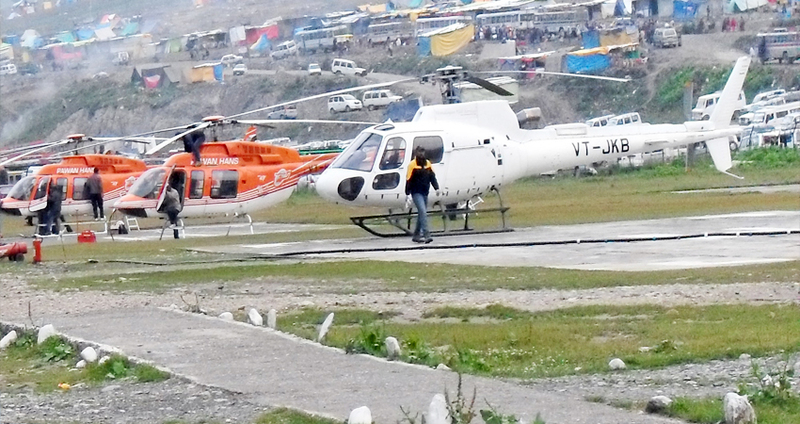 Helicopter service to Char Dham activates from the helipad at Sahastradhara, Dehradun in the Uttarakhand state of India. Char Dham helicopter would depart at a likely time of leaving of 6:30 hrs from the Sahastradhara Helipad at Dehradun. Journey by helicopter, it takes approx 50 minutes to 1 hour each way.